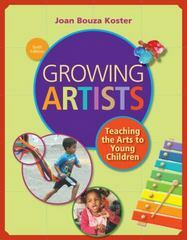 Growing Artists 6 Edition GROWING ARTISTS: TEACHING THE ARTS TO YOUNG CHILDREN, 6th Edition, provides early childhood educators with the theoretical framework and background knowledge needed to design creative arts activities for young children from infancy through the primary grades. Beautifully illustrated with children's artwork, it features a wealth of child-tested, open-ended dramatic arts, music, creative dance, and visual art activities that foster children's creativity. Examples of teaching in action model how to be an enthusiastic and effective teacher of the arts process. This book provides a rich-resource of ideas and approaches that will inspire all those who work with young children to explore the arts process with them.